Production of the Volvo 200 series started way back in 1974 (1975 in the USA) with a squared off shape penned by Volvo's master designer Jan Wilsgaard (known for his Volvo Amazon, P1800ES shooting brake, 164, 140, 740...you get the picture). The sedan version of the 240 might not be as "sporty" as the 2-door or as "cool" as the wagon, but they were built in huge numbers and offer a great combination of passenger room and secure storage space. Wagons get all the glory for having extra storage space, but everybody can see the antique vases and dismembered corpses -- unlike in a sedan, where the junk in your trunk stays away from prying eyes. 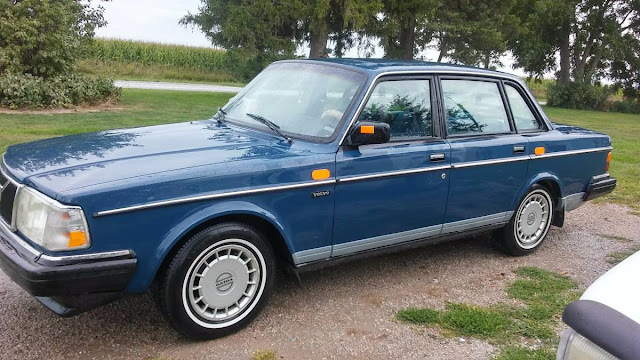 Find this 1991 Volvo 240 Sedan offered for $2000 in Washington, IA. Tip from Zach. !! !Reposting because the idiot that was going to buy it drove all the way from Minnesota with a check when i clearly stated CASH!! !, and sorry this post is so long, but some people are a little "Special".....soooo once again...I have this extremely clean and very well maintained 91 240 Volvo Sedan 4cyl. Automatic with overdrive, for sale or trade. 133K original miles (and going up) which is super low for these cars that are legendary for running 350k and up with just normal routine maintenance. 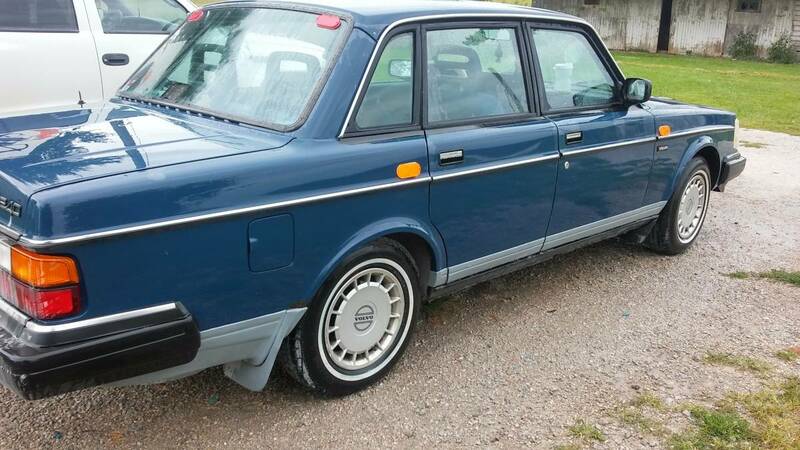 The Volvo is also legendary for surpassing today's safety standards in these older model's. Everything work's perfectly including Ice cold air and oven hot heat ! Heated seats (real bun burner ! ), Sun roof seals tight. Never been smoked in. Normal minor bumps and bruises but nothing really noticeable, it's 26yrs old ! Has many new items that was installed not because they were bad, i'm just a preventive maintenance freak !.. Water pump, thermostat, belts, valve cover gasket, electric fuel pump, fuel filter, fuel pressure regulator, high torque starter, brakes (4 wheel disc), muffler/tail pipe, tires, all new bulbs and Pioneer Bluetooth sound system and battery. This car is ready to go from coast to coast. Super dependable, great on gas 27mpg Hwy 17mpg town. Perfect family car or school/work car. Cheap and easy to maintain. We have had 6 of these 240 Volvo's all with well over 275k miles and one i sold to GM car salesman in Cedar Rapids Ia that has 420k miles and he's still driving it daily ! Asking $2000 (was actually appraised at $2900), CASH or trade for something V8 rear wheel drive and manual transmission. Can be car or truck just so long it's a dependable daily driver and not 4x4 . May consider other V8 rear wheel drive vehicles that are automatic. Only V6 or 4Cyl i will consider are the Contour SVT manual trans, Taurus SHO manual trans or 2dr GM products with the 3.8L or 4.3L. I might put a little cash on top if it is like a Foxbody or something like that. Title must be current and up-to-date in Iowa. Volvo is, As Is Where Is. No broke azz tire kickers ! No long drawn out BS either you want it or you don't ! Nit picking will NOT be tolerated ! LEAVE YOUR PHONE NUMBER OR I WILL NOT RESPOND TO YOU ! No non Iowa area codes ! WILL NOT RESPOND TO: Address? or anything stupid like that ! I know Volvo's are known for their focus on safety. Apparently this owner felt the car was not quite safe enough. Begs the question, are 8 additional reflectors enough?? If the ad is more/less legit this is sweet. Just before I turned 16, my Dad was given a used 240 by his brother, but it was older than this one yet still looked so similar. Even the int/ext colors were the same. Don't recall the circumstances as to why my Dad got it. Anyway, my buddy and I would sneak it out used to beat the livin' snot out of it... like, if I would have caught my kid doing the kind of stuff we did I would have BLOWN. A. GASKET. The 240 would not be deterred as we slung it all over a few back county gravel roads close to the neighborhood. Rainy day? We were drifting before it was cool. The more out of shape, the better. *sigh* I learned A LOT in that car. So true. It's only when you beat on something do you really learn what's happening under there. Lifeguard at day, parked cars at night at a (different) club. Dinner crowd in........lull......crowd out, and during the lull we'd go 'a thrashin' off club grounds. Truly did learn a lot in Dr. Singers' 911SC. Is that grey trim below the rocker panels stock? The whitewalls look terrible. Why did they remove most of the highly sought after factory body reflectors? There are supposed to be 47 more when configured as stock. From the ad copy: "Volvo is, As Is Where Is." This person's poetry is blowing my mind. Also, could be new corporate slogan? It sounds vaguely Taoist, and Volvo's owners are Chinese, after all.